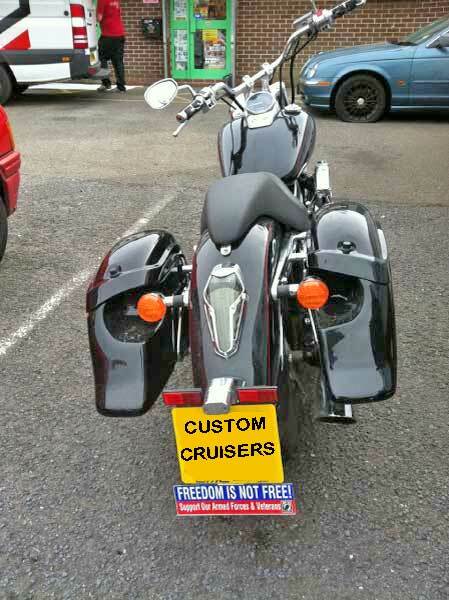 National Cycle Cruiseliner hard fiberglass saddlebags from Custom Cruisers UK super strong FIBERTECH construction not usual ABS!! used by others specifically made to fit your bike using the custom fitting kit available .Made in USA. Red or Amber Reflectors. Custom painting can be applied directly over after a light sand with 400 grit. - Smooth-back bags may be used when eliminating the turn signal stalks. 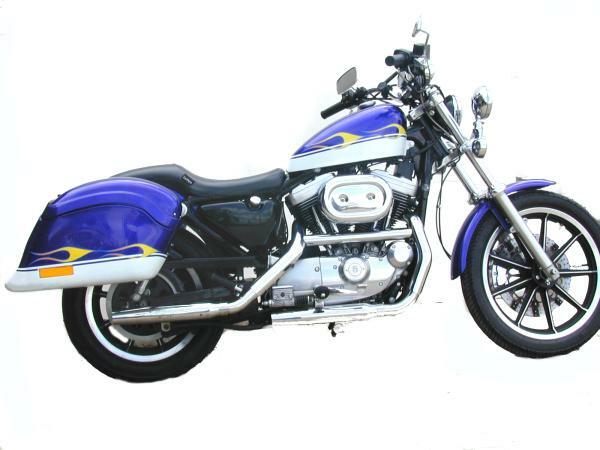 XL1200C/XL883C Custom & XLH1200/XLH883 Sportster -Smooth Back Saddlebag can be used as long as the turn signals are dealt with in a suitable manner. FXD/FXDL/FXDX/FXDC (Dyna Series)-Smooth Back Saddlebag can be used as long as the turn signals are dealt with in a suitable manner. FXSTS Springer Softail- The Bad Boy is all black, the turn signal relocation bracket is chrome plated--the owner may want to paint this bracket to match the motorcycle. 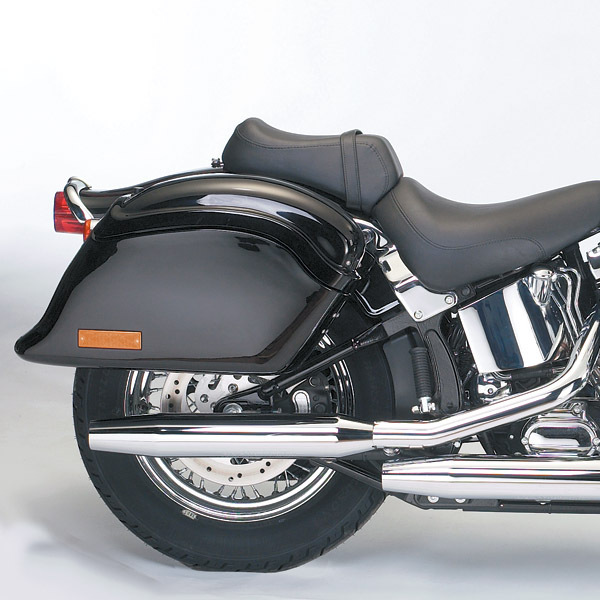 FLSTF Fat Boy 2003-06-Smooth Back Saddlebag can be used as long as the turn signals are dealt with in a suitable manner. FLSTF Fat Boy 1990-02 Smooth Back Saddlebag can be used as long as the turn signals are dealt with in a suitable manner. The Fat Boy comes with a "Shotgun" style exhaust. In order to use KIT-SB404, a low exit exhaust must be used. Staggered dual exhaust is OK. The turn signal relocation bracket will work, but the assembly method for the turn signal is different than the FX Softails and is not documented in the instructions. 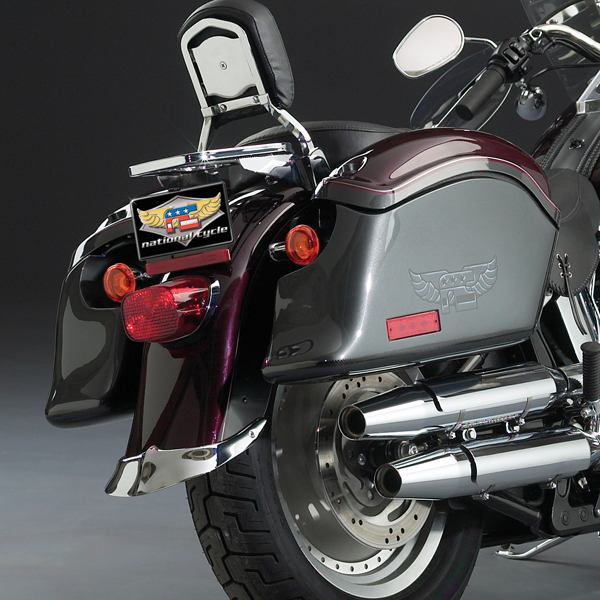 Make your cruiser a "bagger" with National Cycle's best sellingCruiseliner™ Saddlebags! Cruiseliner saddlebags are styled for cruisers. Unlike other bags, Cruiseliners are not bilaterally symmetrical — this enables a tight fit and streamlined styling that flows with the lines of the fender. Cruiseliner saddlebags open easily with a pushbutton lock that flips the lid forward for easy access to cargo. The quality hinge permanently fastens the lid to the bag. The interior walls, lids, and seals are designed to keep the contents safe and dry. Model-specific application will require either the pocketback style (N1100) or the smoothback style (N1101). However, all applications requiring the pocketback style can use the smoothback style as long as the turn signal are relocated for clearance. European versions with amber reflectors are also available. We still manufacture our famous Cruiseliner saddlebags at our factory in Maywood, Illinois. Each year, we offer updated mounting frames for new model cruisers, so no matter what you ride — old or new, big or small — we have Cruiseliner Saddlebags to fit your bike. 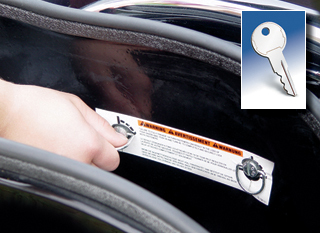 Two quick-detach quarter-turn fasteners are located securely inside the bags for easy, tool-free installation or removal. One key locks both saddlebags lids. Molded from an extremely durable polymer blend. Primed and painted gloss black. 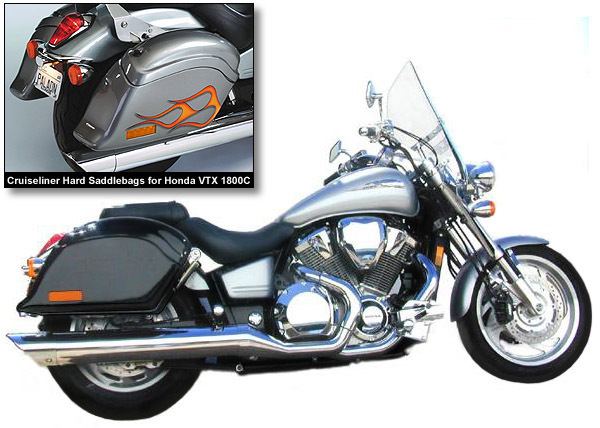 Requires Cruiseliner Mount Kit specific to your make and model motorcycle.